After an incredulous work-out (navigating our way from the air-port to our hostel in a foreign land with language barriers and lugging our duffel up and down various flight of stairs) it is only natural to be rewarded with food. Our hostel is located at Warschauer Straße and seems to be alienated from any real food places, unless you are into settling for some push-cart fare. A brief conversation with the receptionist and us looking very much like tourists, diving into maps and looking at the road signs saw us winding up in a funky looking street, reminiscent of Haji Lane with a much more natural vibe to it. The receptionist had recommended us a cafe but we gave it a miss for the entire street of Kopernikusstraße and beyond was lined up with a rich variety of cafes and shops. 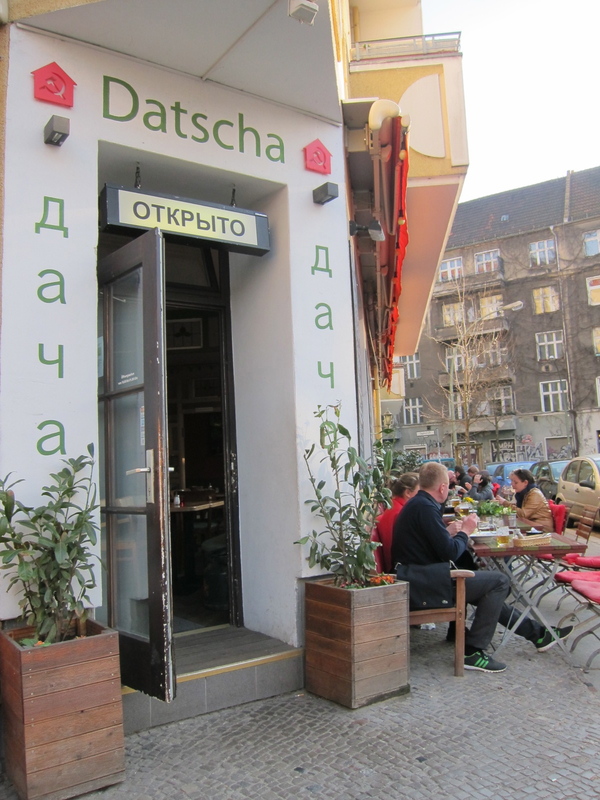 Eventually we settled for Datscha (Gabriel-Max-Straße) after being drawn to the whole set up of the place and it’s popularity with the locals. and all I can say is this was one of the best brunches I’ve ever had. Best impromptu decision ever! It was Easter then so it was supposedly chilly but we were blessed with sunshine amidst the cold on this beautiful Sunday morning. Shades on, alfresco dining, the German accent drifting around, people smoking, backs against walls… ghetto cars, a quiet but happening corner in a neighbourhood…. dining in with the locals with our tired feet and hungry tummies, Datscha puts a great start to our time in Berlin.